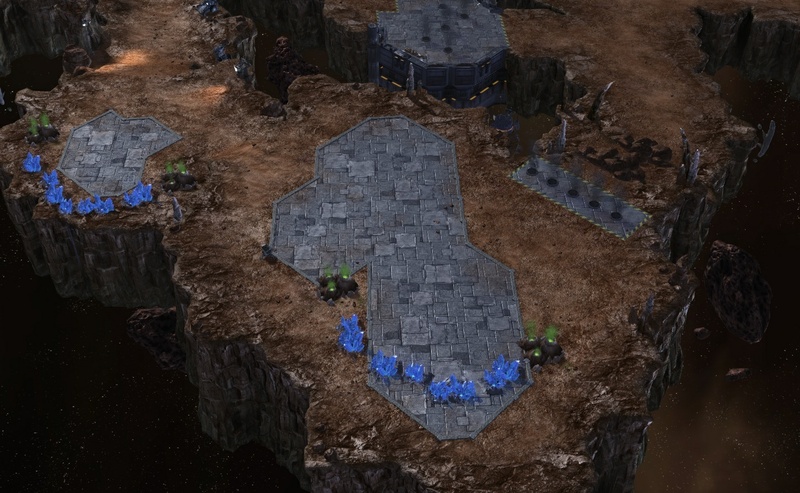 if it takes 3 tumours to get to either of your bases zerg gets screwed because it's harder for them to defend drops or aggression, and depending on spawn positions it can be amplified by the fact it's a 4 spawn map, not only that, it's far enough that it makes it hard for protoss to take a third safely. Having some areas be chokier and others wide open is fine, but your center is just a wide open space with a small hole in the middle where anything daring to travel up there looks like it would just get surrounded by lings and because of the size of the middle it looks like it just shoves everything else out and the main looks like it does that same making the area you have in between very cramped. and if you break down the rocks you basically have 1 direct path to the opponent which I don't think is interesting. 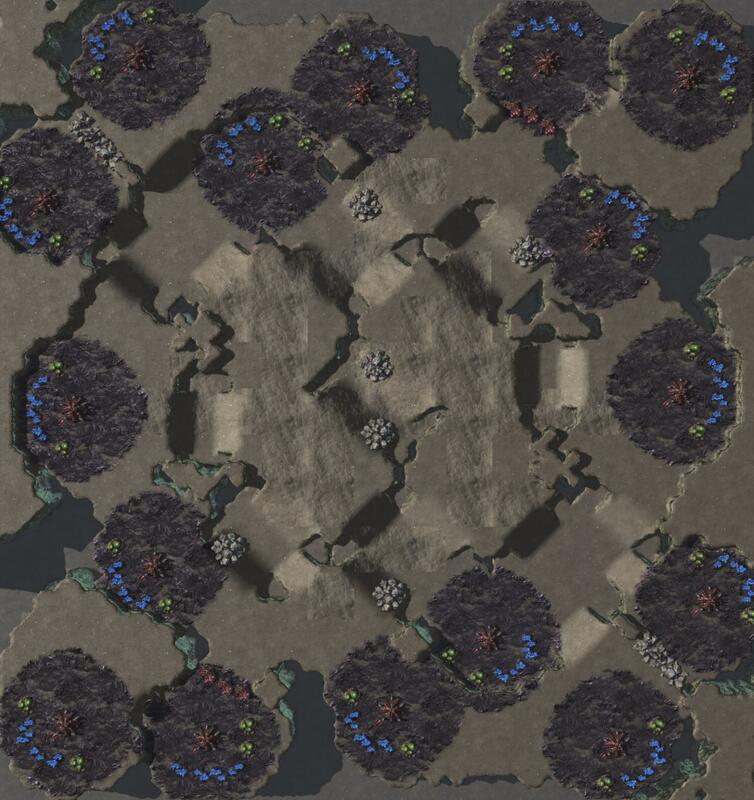 I'm not sure how much the watchtowers will deter drops especially since the most direct route can completely avoid it and the bases are close by air with a lot area covered by the base i think the inhibitor zones would probably do a better job of that. Haha oops Syphon, I did mean 45 degrees! 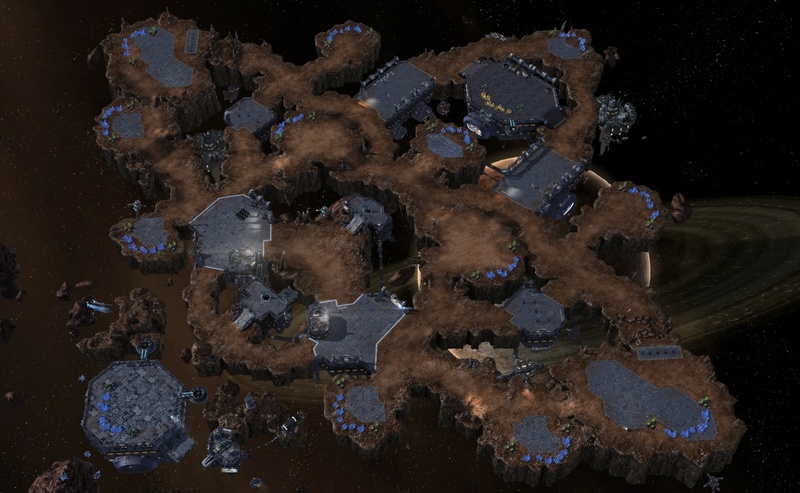 I think most of the issues would be solved with the rebuilt rotated map. As far as the chokiness, I believe there is nothing wrong in theory with open areas and small chokes, but they have to be practical and balanced for fair use by all races. Here, I think the choked area is too long, making it very strong for P/T vs. Z, because there isn't a space to catch the army in a surround. Realistically, it will be difficult for Z to initiate an army fight on the highground (except in cross positions) because P/T have no reason to be up there. Haha, oops! I meant third of course, not natural, and I stand corrected it didn't look like 2 got there when I tried. I think I have a better layout worked out with this now, thanks for the feedback. Choking up the centre a bit, levelling out the sides. It looks way better. But it still doesn't involve rotating it 45! sheesh, work me why don't you. I find it interesting that you two have exactly opposite takes on the high ground centre--Invalid thinks ling surrounds would be OP, you think Z could never engage/surround.... I'm going for ambiguous, so that's good! I don't think monitor means the high ground center, I think he's referring to the low ground where the thirds are intended to be because they are in close proximity and there's a few tight chokes leading into it, the most direct being the one with the rock tower, because that area is so chokey they would never engage into the much more open high ground. but they are forced to if they are north/south or east/west I was more so talking about what looks like x5 or x6 ramps leading into the very open high ground. Noted all, thanks for the feedback. How does this look? Looks better. Your map also reminds me of Crevasse because of the middle and use of rocks. You may want to continue taking inspiration from Crevasse and make the naturals in-base expansions if you don't have enough room. This could also help compensate for the difficult thirds (tbh I don't think you can make the thirds any safer; they're already as close as they realistically can be to the nat/main, and there's no room to push the triangular one any further away from the high ground mid). And hey, risky thirds also incentivize players to take those juicy island expansions! Looks more like Frost to me. I don't really understand the point of the gold island bases to be honest. Why not get rid of them? Other than that good map. Sharing some of my WIPs. A couple of them are almost done. Will probably be posting a thread for at least one of them tomorrow. Really like the first one, but i think you should break up the high ground. 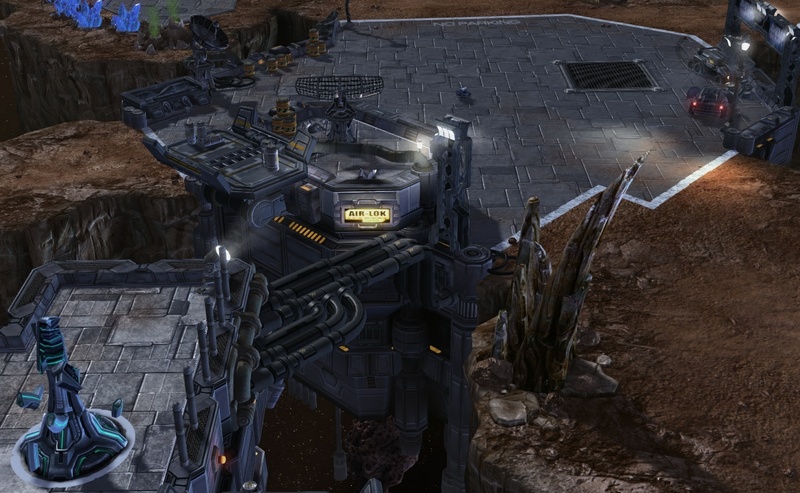 Maybe push the ramp back to the highground corner base, and make the part closer to the lowground thirds a detached pod. I'm unsure what you mean by detached pod. Close the edge path to the low ground third and just use one ramp that leads outside the third choke? Or separate the high ground by that base from the rest of the high ground it is connected to? Both interpretations don't really seem like something that would improve the map, unless the third is too vulnerable. I could experiment with moving the ramp back though. 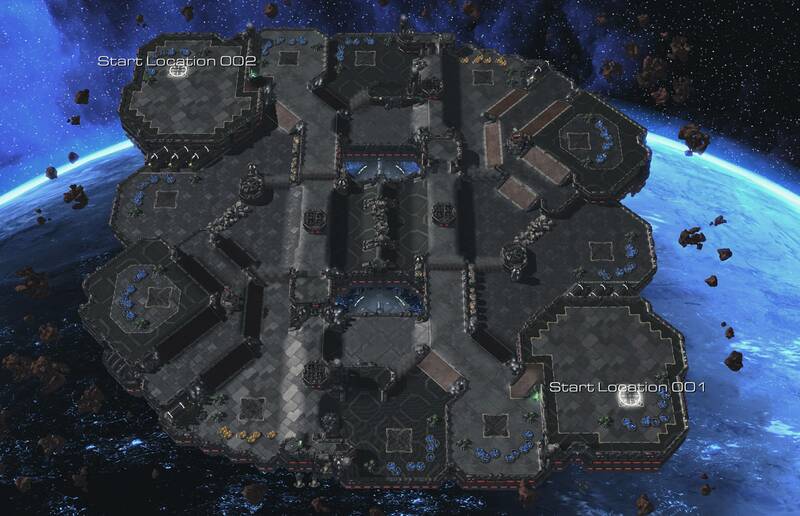 I just recently made a map thread for the first one. The other three are still very much works-in-progress. I'm done with the layout on the second one and have started decorating, but I'm still working on the layouts for the latter two. I'm working on a 4p map, hoping to minimize spawn disadvantages, while keeping a lot of the interesting features of the map (varied game depending on spawns, corners conducive to late game scenarios, 'balanced' asymmetry). Anybody spot immediate problems with this layout? There are slowing zones outside of the in-base expansion. 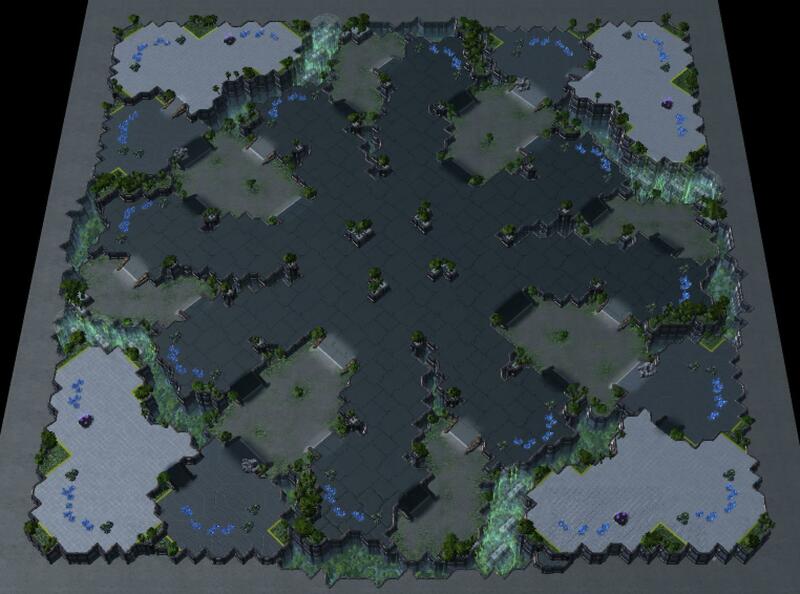 I think if you are trying to minimize spawn disadvantages, an in-base expansion is not a good idea, though I recognize that this is one of the features that makes the map unique. I love using slow zones to affect drops, I think it's clever and not too intrusive. The 3/6/9/12 o'clock low ground paths between the fourths, along with the cliff that extends towards the center, seem overly restrictive to me. While this may be useful for minimizing spawn imbalances by putting pressure on players to move through the center, it may not be the best for gameplay in general. 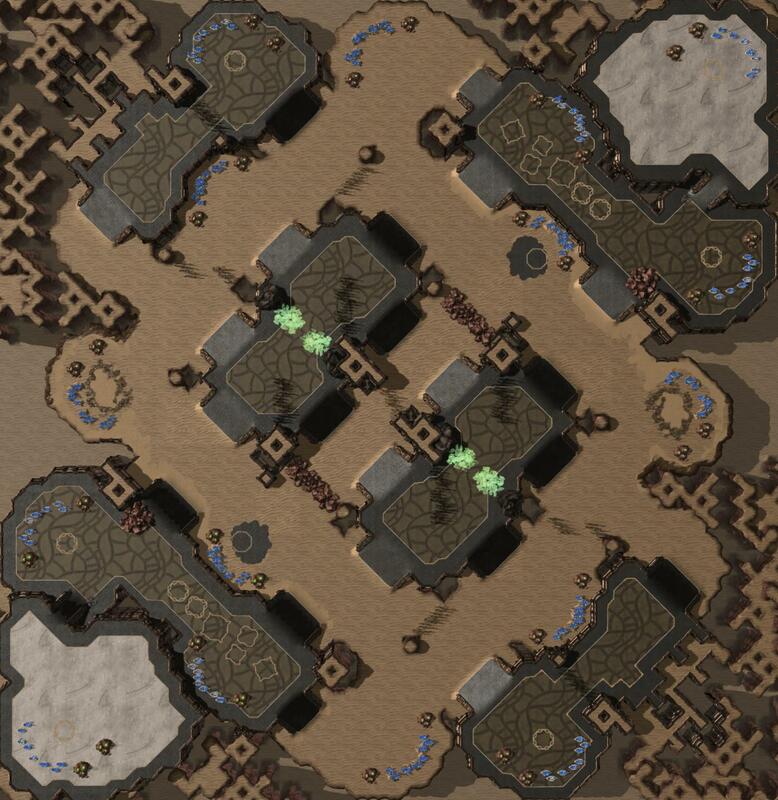 I'm tempted to suggest rocks, but rocks are another feature that can imbalance 4p maps. 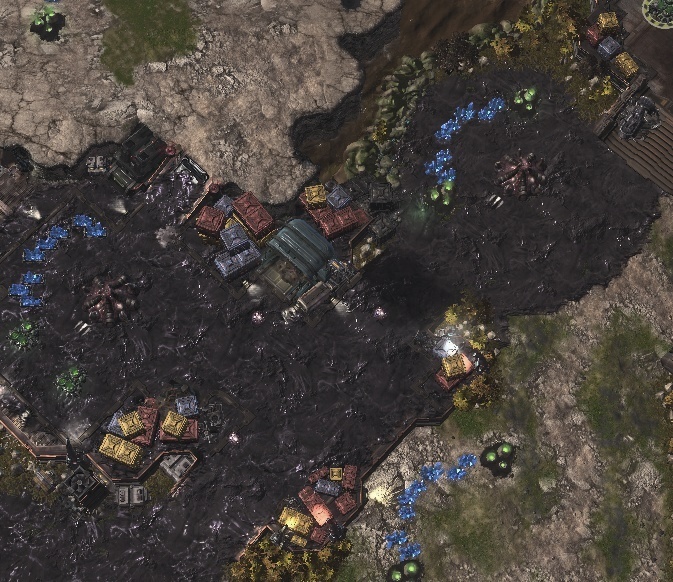 Even though the in-base expansion is a half base, I suspect that the high yield gas will change some of the early/mid game, especially for Terran. I'd love to see some cool build where someone expands to mine only the gas to support a new timing attack. Do you think the rocks that shrink the ramp are necessary? You're already putting three bases (2.5 bases?) behind a single choke. Good points on the limited pathing through the center, I agree that I should open up some pathways for larger scale engagements and opportunities for counter attacks/surrounds. I'll try some ideas and post another pic when I get around to it (I am going very slowly on maps lately). 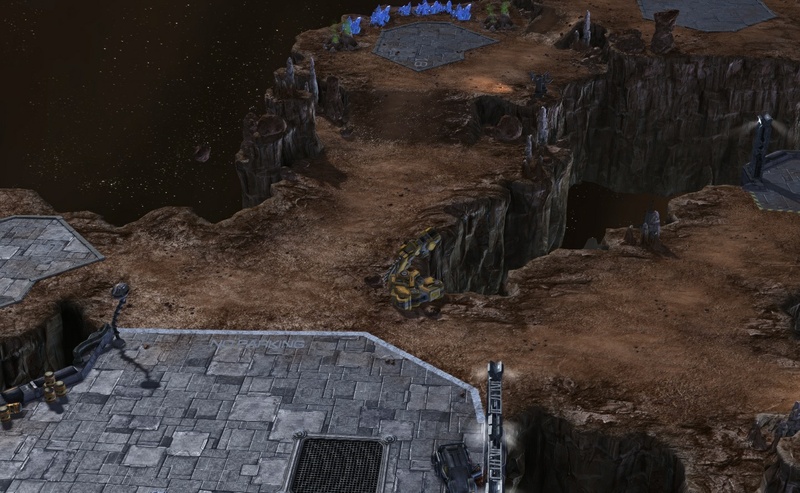 As far as the rocks at the "natural", I think I will have to keep them to allow for regular wall offs (as if it was a 2x ramp), because of the scenario where it is unfeasible for a certain race to take their in-base expansion as a natural. 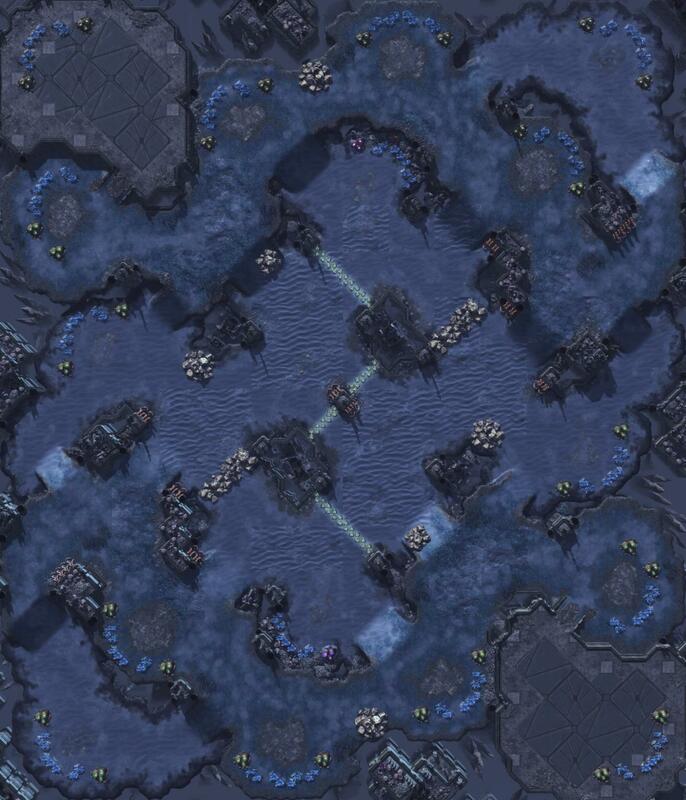 For example, I want to avoid further tipping the scales in a scenario where for some reason Terrans can take their in-base expo as a natural but Protoss needs the double gas expansion in PvT - if the ramp had no rocks, Protoss would be at a serious disadvantage in early game walling a 3x ramp vs. Terran walling a 1x ramp. Obviously once both players take the three bases it doesn't matter, but I want early game to be relatively similar to the current meta. Here's my contribution, Moth Station. Btw how do you add these pics to preview in-game?